At Christmas time this words are sung as part of Handel’s Messiah but this year at the clinic is has been a reality. With the people crying “La Vie Chere!”, we have had babies in trouble and on three occassions their parents chose to abandon them to the clinic. Last August a lady came to us and said that a mom had asked her to hold her little girl while she went out to buy something to eat. Four hours later the lady had received her lab results and was ready to leave but didn’t see the mom anywhere! Felix began the search for the mom and went and made the report to the police. As soon as he got back to the clinic, the staff reported that another child, a little boy, had been left sitting on the benches in the waiting area. Fortunately, the mother of the little girl had a change of heart and returned a few hours later, was positively identified by the staff and was reunited. Up to now, we have had no contact from the family of the little boy. He was very malnurished and we had to guess that he was at least two years old. We gave him the name Jeremiah Joshua or JJ for short. 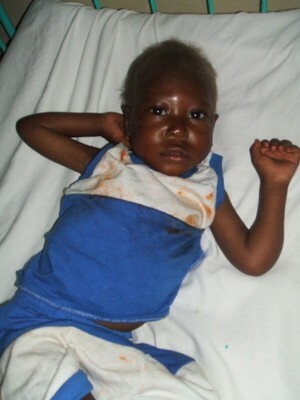 He remained in the clinic for about two months receiving special care to reverse the malnutrition. Currently we are using a special, enriched peanut butter called “Medikamamba” that the children like and that provides them with a good combination of protein and nurtients. Matthew was very helpful in carrying food and supplies to JJ and they became fast friends. After he was stabilized, he was moved over to Bethany, the SA children’s home here in FDN where he was instantly surrounded by a host of “little mothers” and lots of kids to play with. We are looking into the possibility of placing him with a children’s home specializing in adoption so that he will have a chance to be placed in a permanent family. 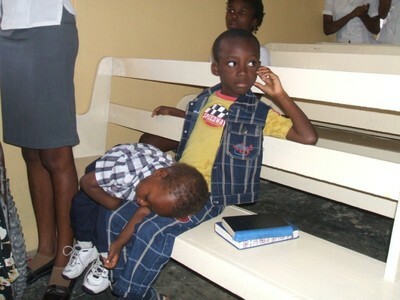 Here he is at the corps the other day using Matthew as his pillow. 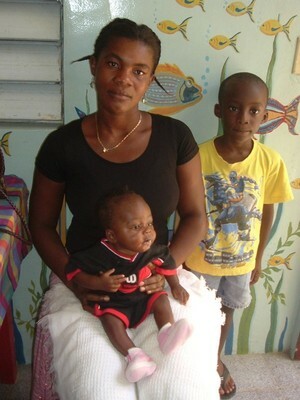 Last April a woman named Antoinise came to us to see if we could help with her sister’s baby. The teen-aged sister had died a couple weeks after delivery of complications. The family was committed to caring for baby Benji but was faced with the high cost of the baby formula. Each can is about US$ 6.50 and it takes about 2 cans a week. The monthly income for someone working in a low skilled job is about US$100 so this would mean that they would pay more than half of their income just on baby formula. And that is if they had a job. It just so happened that I had just received a gift from a friend in the US that could be used for anything. 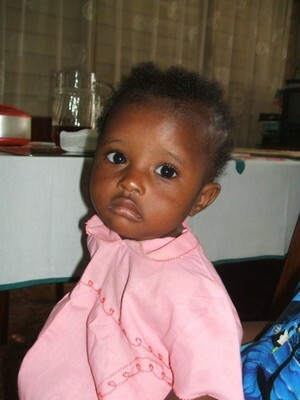 I agreed with Antoinise to provide half of the baby formula if the family could buy the rest. 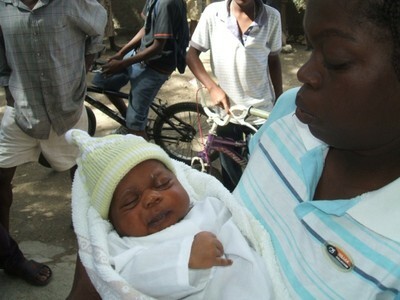 So over the next six months, she came faithfully to the clinic for the milk and Benji’s life was saved. 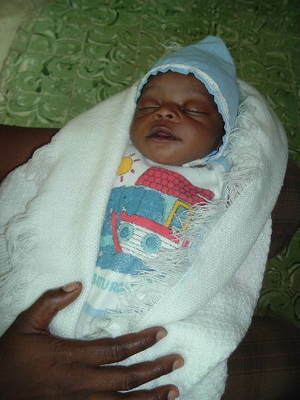 Then, just a month ago, another baby boy was left in the clinic by his mom. The staff thought that she had just left to buy necessities but when she didn’t return and the baby started crying, they took action. We were able to find some bottles from Matthew’s early days to get him started. However, two days later family members showed up, stating that the mom had some mental problems and that they didn’t know where she had put the baby. 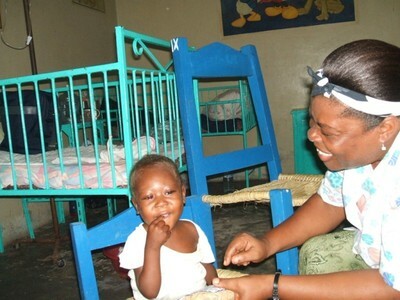 All in all, we were glad that she had the presence of mind to put the baby where he would be cared for. With the support of the police, the parents of the child were counselled and then reuinted with their son. Pray for the people as they deal with difficult choices as a result of difficult times. Pray for us here at the clinic that we will have the wisdom of Solomon in handling what comes our way. God bless the children! The children are so precious. I am thankful for the somewhat happy endings for the families. I will continue to pray for the work of the clinic. Praise the Lord for the blessing of the money from the states, and a blessing that the mum was willing to go 50/50 to save her baby’s life. This sure gives a new perspective to Unto us a Child is born. We take so many things for granted. Blessings on you and Felix as you continue to minister to these families. SHALOM! Merry Christmas! And God bless you as you minister in such an important way. “Religion that God our Father accepts as pure and faultless is this: to look after orphans and widows in their distress…” May God strengthen you for the tasks He has prepared beforehand for you to do. Praying for these children and families…your work is amazing…makes me want to come and bring a child home with me! Oh for another baby!